CO2 fire extinguishers are the extinguisher of choice for electrical fires, although they also work on flammable liquid (class B) fires. We explain all in our simple guide. Summary: CO2 extinguishers are primarily used for electrical fires and often paired with foam extinguishers. CO2 fire extinguishers discharge CO2 gas, also known as carbon dioxide. This is stored in the extinguisher as a liquid, and the gas is created under pressure when the handle of the extinguisher is squeezed. This causes the CO2 gas to emerge at great speed, which is why CO2 fire extinguishers are not recommended for chip pan fires – they could literally blast the flames into surrounding areas. 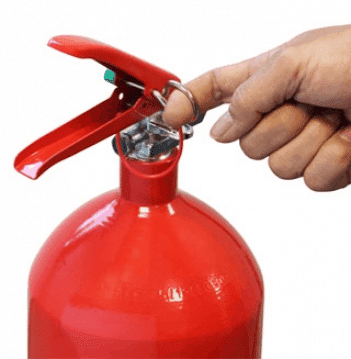 Unlike water and foam extinguishers, CO2 fire extinguishers do not work by cooling the fire and so are ineffective on fires involving flammable solids. Instead, CO2 extinguisher work by replacing the oxygen surrounding the flames with carbon dioxide, meaning the fire can no longer burn. Pros: extremely effective on electrical fires; do not leave any residue behind when they are used. Cons: risk of cold burns if the user holds the extinguisher by the horn; less environmentally friendly than other types of extinguisher; they replace the oxygen in the air with CO2 so risk of asphyxiation if used in confined spaces. 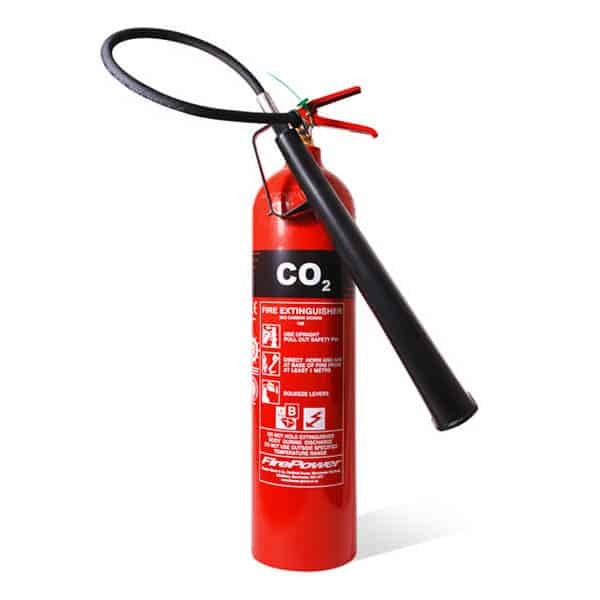 CO2 fire extinguishers are particularly suitable for offices where there is a lot of electrical office equipment. Pairs of CO2 and Foam extinguishers are often recommended for this kind of internal environment, as this covers the vast majority of fire risks likely to be found. Use CO2 extinguishers carefully, avoiding holding the extinguisher by the horn. Remember – don’t use CO2 extinguishers in a confined space. In all cases, firstly remove the safety pin to break the anti-tamper seal, and stand well back from the fire. Avoid holding the extinguisher by the horn. If you think you need CO2 fire extinguishers, or you’re not exactly sure what you need, please get in touch with our friendly team by calling 0845 845 3001, or emailing info@surreyfire.co.uk. They can arrange a free survey visit for you from a BAFE registered engineer.